Get Rs. 50 Paytm cash by sharing your opinion via survey @ IndiaSpeaks.net, Surat. Offer is valid for all SURAT users. Valid till 15th May 2017. Get Rs. 50 Paytm cash after completing the survey successfully. IndiaSpeaks is an online survey panel where consumers join hands to shape and develop products and services by voicing their opinions through surveys launched by brand-owners. The IndiaSpeaks panelists represent a wide spectrum of age, income, demographic profile and professional attributes. We have the ability to reach respondents across all major metros, Tier-I, II, III cities through multiple methodologies, including Online, Phone2Web, Face2Face and mixed access. Considering India being a multi-lingual country, we have the capabilities to carry out surveys in all regional languages across India. IndiaSpeaks offers the widest, most diverse access to consumer, B2B and healthcare audiences around the globe. Get Rs. 50 Paytm cash by sharing your opinion via survey. 3. Participation in the Campaign open only for 10th May 2017 to 15th May 2017. 4. Offer is valid for all SURAT users. 2. Click on view to find the survey link or check the registered email id for the link. 5. 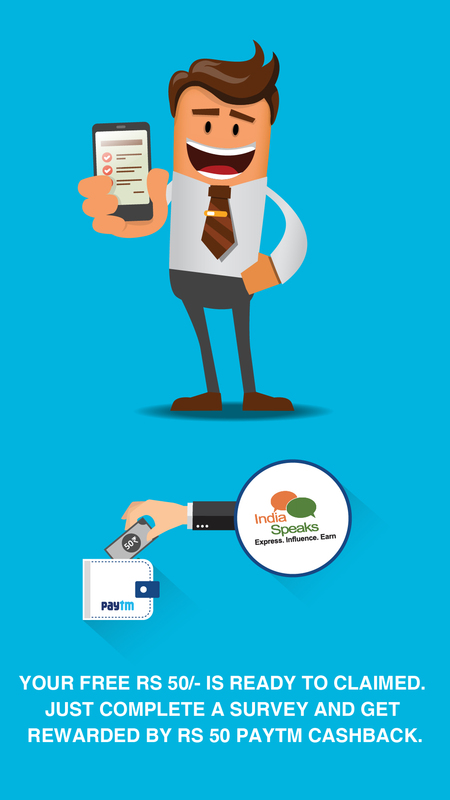 You can utilize the amount by redeeming for various options available in Paytm.